The itinerary for the day is listed below. Please read it, be prepared, and be on time so we can start the season off right! Truck departs for parade staging area: will park on Technology Drive (see map below). All Fishers Marching TIGER Band personnel meet on Visionary Way (intersects Technology Lane, which is just north of Lantern Road and Commercial Drive intersection — see map below). Fishers band is in division #5 and will meet on the west side of the building. Look for the RED parade shirts. DROP OFF / PARKING – Parking is available in areas around the Fishers Library (Launch Fishers, Fishers Municipal Complex). For those dropping students off, you can drop them by the Library and students may walk down Technology Lane to Visionary Way. Alternatively, you can try dropping marchers off closer to Visionary Way by driving up the back way via Fishers Corner Blvd. Parking in this back area is reserved for persons with parking passes (those marching and supporting marchers). Before 3 pm, you should be able to drop off marchers. Leave your case in your cars except for large instruments which came via the FHS band trailer. Approximate end time. We will finish and march back to where we started on Visionary Drive. 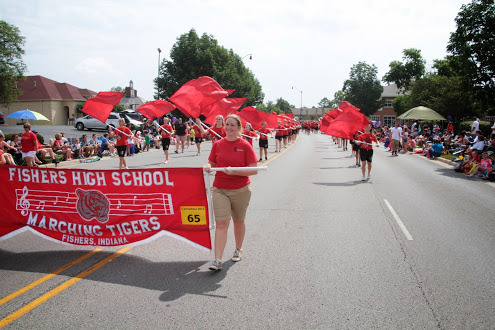 Individuals picking up anyone after the parade at Technology Drive can only enter at Technology Drive from Commercial Dr.
Large instruments need to load their instruments onto the trailer and meet us back at FHS to unload. We will march rain or shine. A live feed of the parade can be viewed on the Fishers Freedom Festival website.